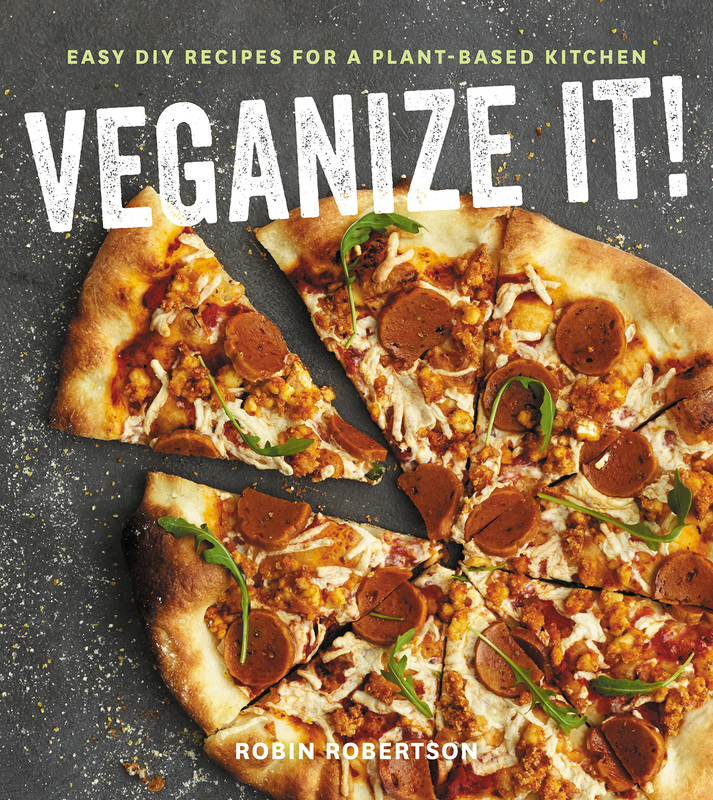 Delicious vegan meals are fun to prepare in your own home kitchen with Laura Theodore’s highly anticipated new cookbook, Jazzy Vegetarian’s Deliciously Vegan: Plant-Powered Recipes for the Modern, Mindful Kitchen. 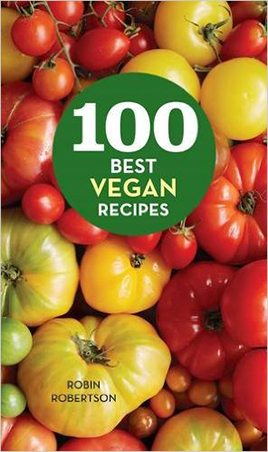 This modern guide to vegan eating is a 320-page cookbook featuring Laura’s recipes (many from her award-winning PBS television show) and includes beautiful full-color photos on nearly every page. From simple snack ideas to enticing entrées to mouthwatering desserts, Jazzy Vegetarian’s Deliciously Vegan features delectable main dish recipes like Teriyaki Kebabs, Sunny Black Bean Burgers and Gingered Portobello Steaks. Crowd-pleasing party foods include Guacamole Mini Peppers, Chili-Maple Almonds and Miso Hummus. 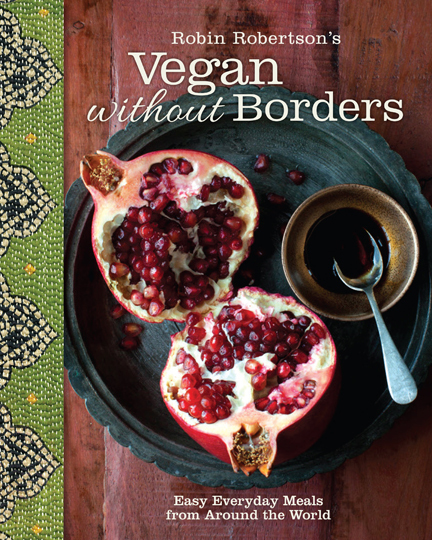 Vegan Burritos with Tofu Queso Fresca, Golden Cashew Milk and Seitan Fajitas round out diverse dinner menus. And for dessert, Laura has plenty of scrumptious sweets to choose from, like Lively-Lemon Cupcakes, Sweet Potato Pie and Divine Chocolate Mousse Cake. 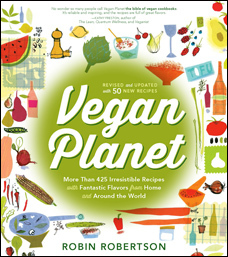 Highlighting holiday entertaining to everyday ideas for preparing quick and delectable plant-based meals for the family, Laura Theodore’s is the ultimate guide for the vegan home chef. 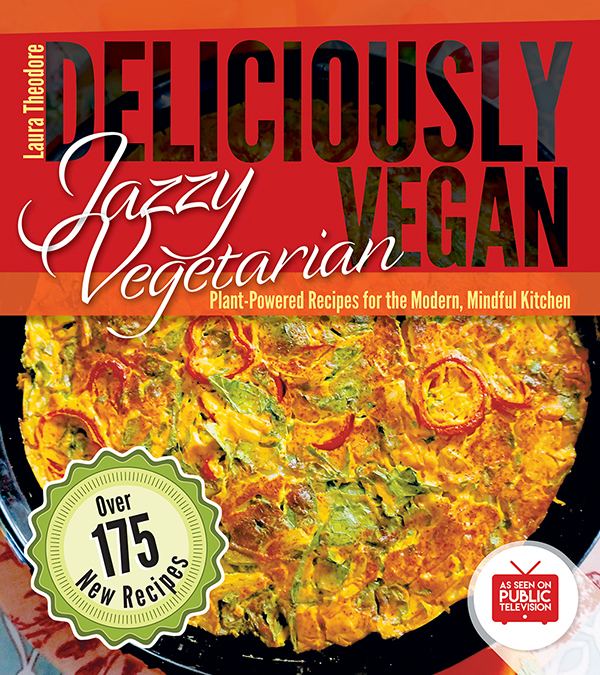 Would you like to own a copy of Jazzy Vegetarian’s Deliciously Vegan? 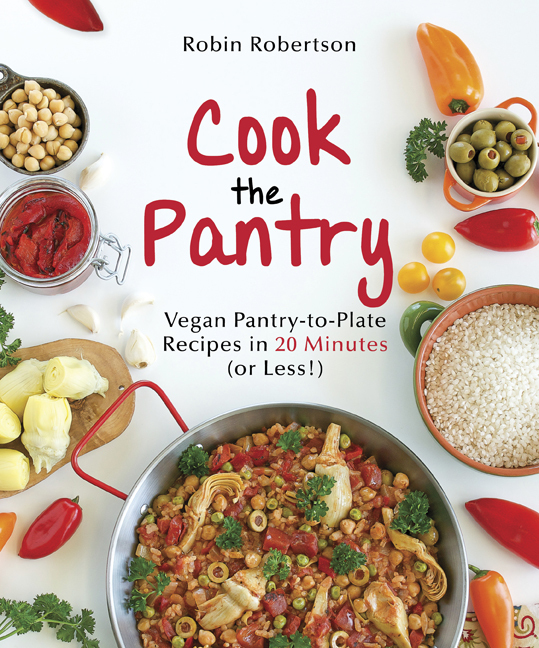 Just leave a comment at the end of this post telling me your favorite easy vegan meal and you’ll be entered in the giveaway. The giveaway ends on Monday, March 5th at midnight. The winner will be announced on Tuesday, March 6th. I adore artichokes. I have loved ‘em since I was a little girl and whenever I see beautiful varieties in my marketplace, I cannot resist them. This recipe is festive and filling with cashews and sunflower seeds showcased in a flavorful stuffing. I like to serve this colorful dish as a first course, or they do double duty as a luncheon entrée. Preheat the oven to 400 degrees F. Spread the canned tomatoes with juice over the bottom of a 9 by 12-inch or similar sized casserole dish. Sprinkle the minced garlic evenly over the tomatoes. Put the bread, cashews, sunflower seeds, basil, Italian seasoning and sea salt into a blender or food processor and process into coarse crumbs. Transfer to a medium-sized bowl. Add the olive oil and stir to combine. Add the fresh tomatoes and gently stir, until thoroughly combined. 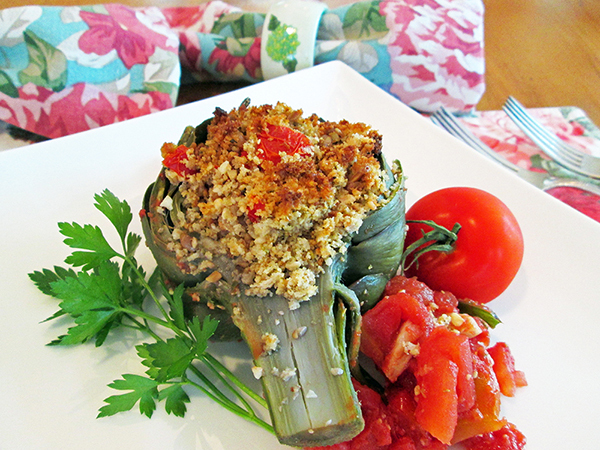 Arrange the artichoke halves, cut-side up, on top of the tomatoes and garlic in the prepared casserole dish. Stuff each cavity with one-eighth of the cashew/sunflower seed mixture. Cover with foil and bake for 40 to 45 minutes. Uncover and bake for 10 minutes, or until the top of the stuffing is golden brown. To serve, put some of the tomato sauce from the bottom of the casserole dish on each of eight individual serving plates and top it with 1 stuffed artichoke half (see note). Serve warm or cover, refrigerate and serve cold. To trim and clean the artichokes, start by cutting off the top 1/2 to 1 inch of each artichoke to remove the spiky tips. Cut off any remaining spiky tips with kitchen shears. Trim away the tough edges of the stem. Rinse each artichoke under cold running water, spreading the leaves to rinse out any residual dirt or sand. To cook the artichokes, put 3 to 4 inches of water in a deep saucepan large enough to hold all the artichokes snugly so they remain upright as they cook. Stir in the balsamic vinegar, if using. Add the artichokes, making certain they are standing partially upright. Cover and bring to a boil. Cook the artichokes until crisp tender, about 20 minutes. They are done when an outer leaf peels off easily. Remove the artichokes from the pan using tongs and arrange them upside down on a rack set over a large dinner plate to drain and cool. Once the artichokes are cooked and cooled, you can remove the “choke.” Begin by cutting each artichoke in half, vertically. Scoop out the fuzzy center choke with a grapefruit spoon or teaspoon. 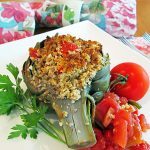 If you are cooking the artichokes ahead of time, wrap the artichokes tightly in plastic wrap and refrigerate for up to 1 day before preparing this recipe. 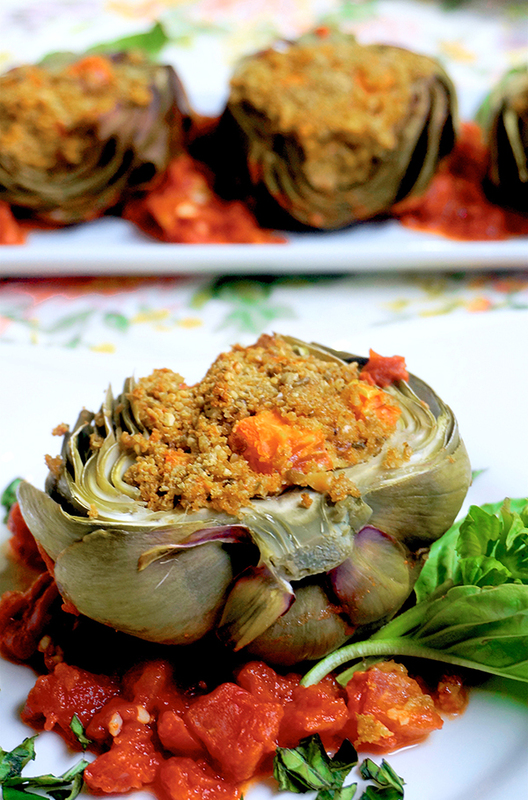 If you are serving this as a luncheon entrée, serve 2 artichoke halves per person. 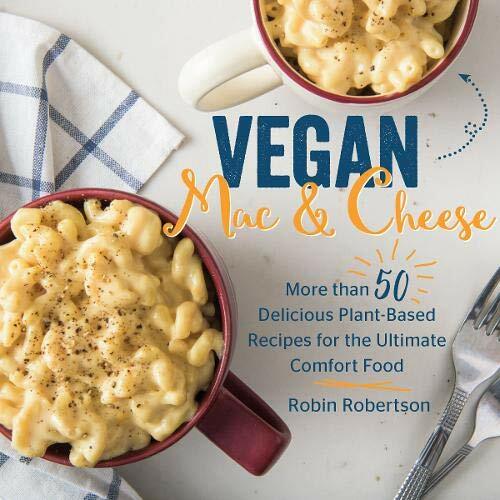 Wow, these look amazing, and love Jazzy Vegetarian! 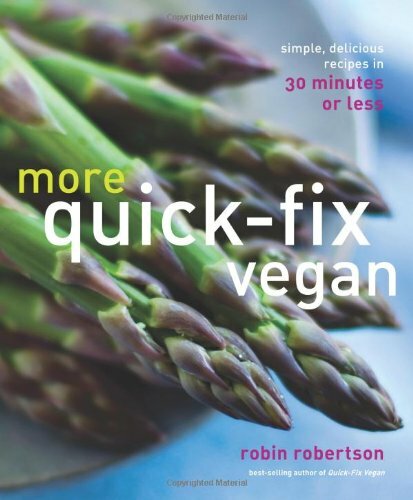 This book looks great, thanks for the give away Robin. Our favorite easy vegan meal is whole grain pasta with garlicky broccoli and marinara topped with toasted pine nuts. I about to make it now for dinner! My favorite easy meal is usually just a veggie burrito that I have frozen and can pull out and defrost. This looks fabulous and thanks for the chance! I love your mac and cheese with broccoli for a fast, easy meal! Thank you for the lovely recipe and the chance. Taco salad is my go to. More like a deconstructed Taco bowl. I answered the wrong question. 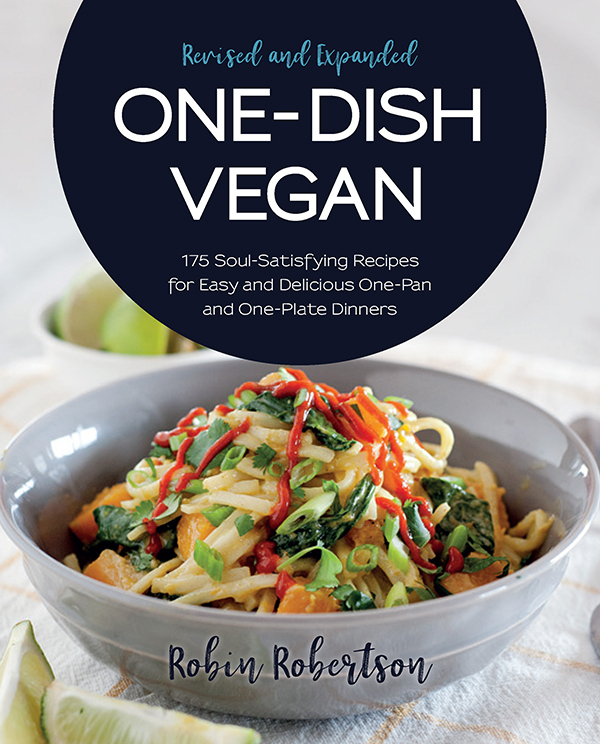 My favorite is vegan Pad Thai!!! I love a good vegan burrito! Looks like a great book. Favorite quick meal is salad! I lobe love butter tofu over brown rice !! Yummy!!! My favorite easy vegan meal is vegan tacos made with either walnut or lentil “meat”, avocado, salsa, lettuce, & vegan sour cream. My favorite easy vegan meal is dale and rice with a side of whatever veggies I have in hand ???? 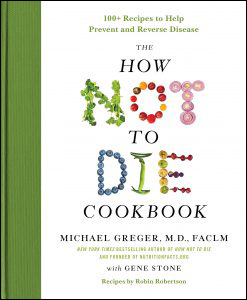 I’d love this cookbook. I miss seeing the Jazzy vegetarian show on PBS! My favorite easy vegan meal is a big Buddha Bowl with a kale base, farro or brown rice, and every bright veggie I have in the fridge! I’d love to win a copy of your book. ???? My favorite easy vegan meal is a big Buddha Bowl with a kale base, farro or brown rice, and every bright veggie I have in the fridge! I’d love to win a copy of your book. On these cold winter nights after a tough work day, we enjoy miso soup (with almond butter added, yes! It’s delicious! ), brown rice, and some roasted veggies I pop into the toaster over and crisped kale. This looks delicious! Wish artichokes were easier to find in my area. My favorite easy go to vegan meal would have to be stir fry! I love how it’s technically the same meal, but with all of the different noodle, vegetable, and sauce options it’s always different! Big fan of you both! I have a rotation of favorite meals, especially using the new air fryer- crispy cauliflower tacos with the usual fixings is a go-to. Those look so good. My favorite easy meal is stuffed shells with tofu ricotta. Anything pasta is a go to for our house! I love throwing together an easy veggie stir fry. Spaghetti squash tossed with chic peas , veggies and fire roasted tomatoes with cashew parm! Curries are my go-to meal when I’m starving; super easy, super spicy, super affordable, and you can throw just about anything in there. I always keep coconut milk and Indian and Thai spices around for when I have veggies I’m not sure what to do with.